Described as an Epson-compatible dot-matrix printer, the Aero is rated at 130 cps. It uses a 6x9 matrix field, contains a 2K buffer and supports (all on the same line) superscript, subscript, double strike; enlarged and emphasized print and underlining. Alphacom claims this new 20 character-per-second daisywheel printer is the perfect printer for your Atari. 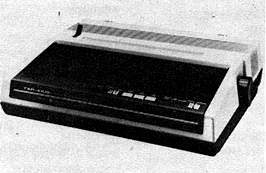 Plugging directly into your Atari, the PlusWriter emulates the Diablo 630 and uses standard ribbons and daisy-wheels. We are told that the printer supports superscript, subscript, boldface, proportional spacing and underlining. 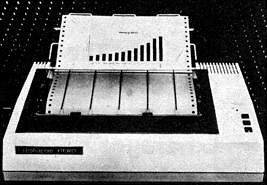 GE's foray into the home computer market includes a dot-matrix printer capable of "letter quality" print at 25 cps or regular draft printing at 50 cps. The interface will connect the printer directly to an Atari. This monthly adventure game newsletter covers recent news, reviews, and the like. It is not Atari-specific. This surge/spike filter not only protects electrical lines for computers and peripherals, but also protects two modular phone lines (providing exactly the kind of filtering and protection the Atari 1030 modem doesn't have). A 300-baud direct connect modem with autodial, autoanswer and other advanced features, the Q-Modem plugs directly into your Atari and fits in the palm of your hand. It even comes with the famous QuanTerm software, which uses color displays, on-screen menus, a built-in editor, multiple buffers and so on.